Welcome to Alaska's Invasive Plant Program. Our program coordinates prevention, outreach, and management strategies for invasive plant issues through collaboration with land managers, agencies, organizations, and policy makers across Alaska. These efforts are guided by the implementation of our Strategic Plan and relevant noxious weed regulation and policy. Our goal is to help keep Alaska's pristine landscapes and natural resources free from impacts of noxious and invasive plants. 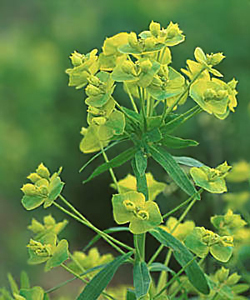 Leafy spurge is listed as a noxious weed in Alaska, in 22 other states and in Canada. 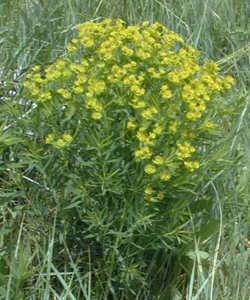 Leafy spurge can reduce species diversity and exclude native forage populations. Due to the unpalatable and toxic properties, most grazing animals avoid it. Disturbances in soils promote the establishment of leafy spurge, allowing it to take over roadsides and developing areas. Leafy spurge can be carried in commercial seed, forage, and hay; potentially impacting agricultural areas of the state. Leafy spurge has not been found in Alaska, but grows throughout most of Canada. It also has been documented in 35 states. The most effective method of controlling leafy spurge is to prevent its establishment through land management. If you find a new infestation, call 1-877-INVASIV. Due to the extensive root system, hand-pulling this plant is not an effective management method. Mowing will reduce seed production if repeated every 2 to 4 weeks during the growing season, but will provide little long-term control. Establishing selected native grasses have been proven effective. Herbicide applications may also be effective.